I love growing sweet potatoes. They’re easy and delicious, but they do take up space, and I don’t have room for many plants. Unfortunately, the slips are usually sold in bunches of 12 or more, which in the past has led me to either squeeze more plants in a bed than will comfortably fit, or to follow people around asking wouldn’t they like a slip or two. This year I discovered that Southern Exposure Seed Exchange sells single-type or mixed sweet potato slips in groups of six – not as good a deal per plant, of course, but it does stop me constantly informing my friends that actually sweet potatoes make a lovely annual ground cover, and that you can grow them in containers, and the leaves are edible and nutritious, and really you don’t need that extra squash, you want a sweet potato instead. I ordered the purple, orange and white set, and received six very healthy slips (frequently they look like they’re about to expire, although they often revive on planting), two each of All Purple, Ginseng, and North Carolina White. This one is Ginseng, which will produce orange-fleshed tubers. 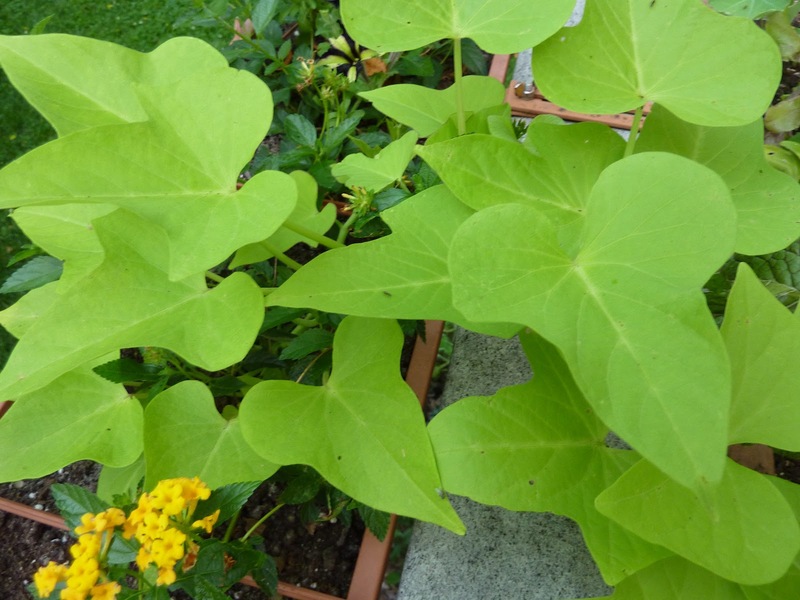 Each of the three has different-shaped leaves; this one reminds me of the ornamental sweet potato vine ‘Blackie,’ which I don’t have a picture of (you can find them online). The ornamental sweet potato vine I’m growing (in window boxes with petunias and lantana) is ‘Marguerite,’ which has leaves more like the sweet potatoes I’m used to (such as ‘Georgia Jet,’ which we always grow at the demo garden)..
“Ornamental sweet potato vine” is to be taken literally, by the way. They are ornamental, but they are also sweet potatoes, with edible tubers (I wrote about eating them here). I wouldn’t grow them for the tubers, or for the edible leaves either, because they are bred for beauty not taste, but if you are growing them to jazz up your ornamental beds, it’s worth cooking them when you dig them up. As for the six plants in my vegetable garden, I’m hoping for tasty results! I don’t think I’ve ever eaten a purple sweet potato, so that will be an interesting experience. I’ll share pictures, of course. 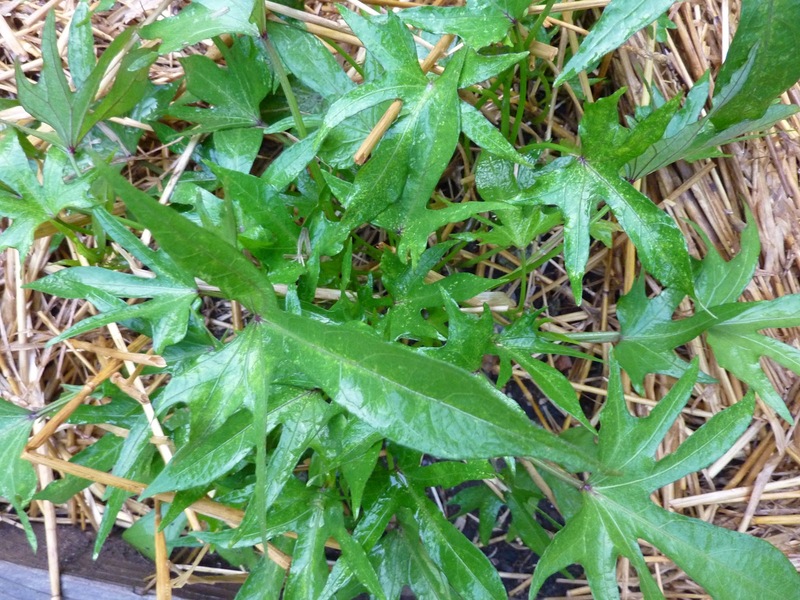 ← Year of Leafy Greens: Vegetables out, weeds in? I'm growing Bush Porto Rico sweet potatoes in pots from slips I bought at Southern Exposure. So far, so good! Would they grow in NH, given that we are now #14 in the list of fastest warming states?